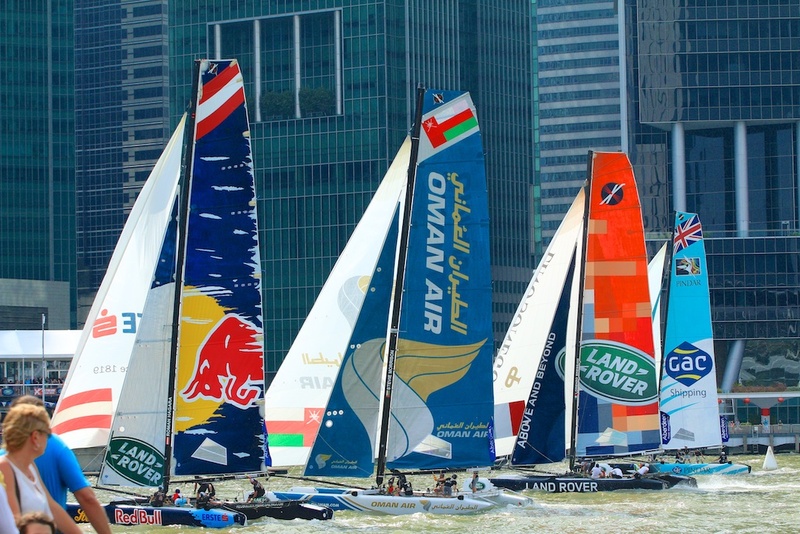 The Extreme Sailing Series 2015 returned back to Singapore for the opening sailing race calendar in the heart of Marina Bay Singapore. Held from the 5th to 8th February 2015, it was great to see high octane sailing action in the heart of Marina Bay, surrounded by the heart of Singapore’s Central Business District, joined by tricky wind conditions and directions, posing great challenges and tactics by the captains and their crews! Our gorgeous and magnificent Marina Bay Singapore is truly a “stadium-style” racing circuit for the competition boats, sailors and spectators. Enclosed in a 600m by 300m racing circuit surrounded by many different types of buildings, it was a great spectacle to watch the boats sailing pretty close to the sides of the Marina Bay. 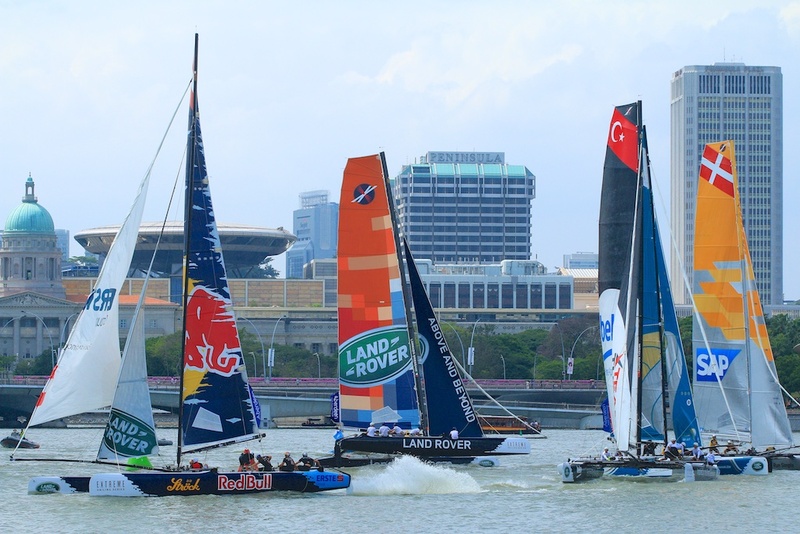 Due to day job commitments, I was only able to cover the Extreme Sailing Series 2015 Act 1 – Singapore on Saturday 7th and Sunday 8th February. The weather was great; it was hot and sunny, with strong winds blowing. It was pretty good for the sailors and spectators alike, to watch the Extreme Sailing Series competition. With experiences gained over the past 2 years of Extreme Sailing Series in Singapore, I managed to photograph the 40-feet multihulls in action from 6 different spots around Marina Bay, providing me with more different perspectives and views of the Extreme Sailing Series in high-octane action on the waters of Marina Bay Singapore! The spectators were able to view the competition not too far away from the Bay sides and they were able to watch how the sailors adapt and react to different sailing conditions and situations on the boats! The winds were tricky, shifty and gusty at times, ranging from 15 knots to 21 knots! Spectators watching from different locations of Marina Bay Singapore were at times given some exciting and heart pumping moments when the boats went all the way out, catching the strong winds pushing them. There was a great sporting action moment when 4 boats raced to the buoy pretty close together and making a U-turn there! 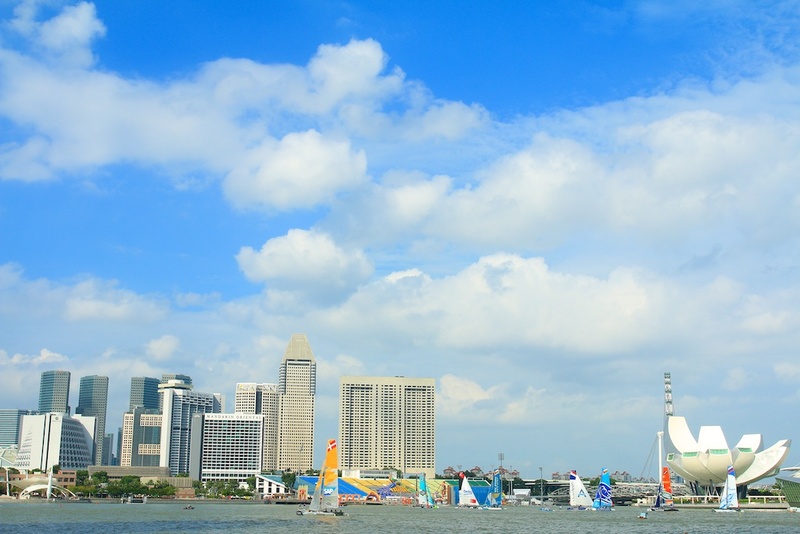 On the 4th day of the Extreme Sailing Series 2015 Act 1 – Singapore, the spectators were treated to a nail biting finish by Red Bull Sailing Team to be crowned champions in Singapore for Act 1 – Singapore. With some competition scoring points advantage coming into Day 4 over SAP Extreme Sailing Team, the Red Bull Sailing Team held their nerve to overcome an onslaught by the SAP Extreme Sailing Team in the final race to beat them by just five points! This was definitely a very close fight to the finishing line and the bragging rights to be called champions in Singapore for Extreme Sailing Series 2015 Act 1! 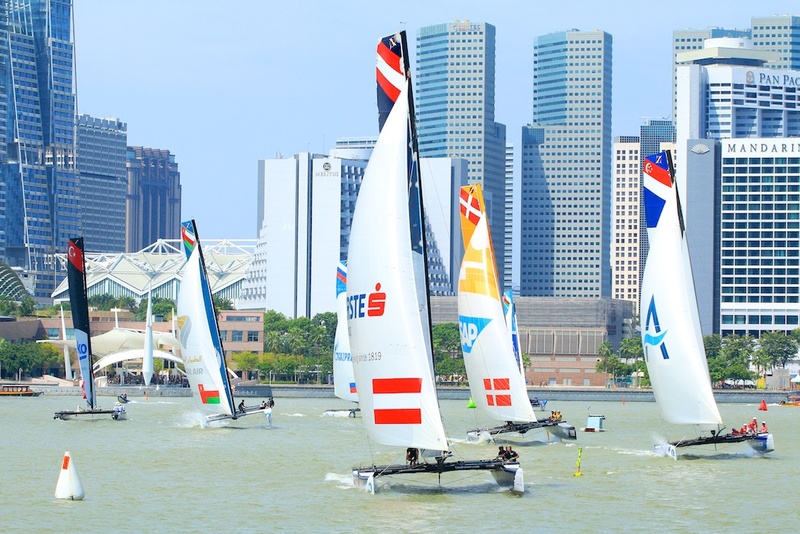 The Extreme Sailing Series 2015 Act 1 – Singapore came to a spectacular end with Red Bull Sailing Team leading the Extreme Sailing Series 2015 overall standings. Next up is Muscat, Oman from 11 to 14 March 2015! 1st Red Bull Sailing Team (AUT) Roman Hagara, Hans Peter Steinacher, Jason Waterhouse, Shaun Mason, Stewart Dodson 232 points. 2nd SAP Extreme Sailing Team (DEN) Jes Gram-Hansen, Rasmus Køstner, Thierry Douillard, Mads Emil Stephensen, Brad Farrand 227 points. 3rd The Wave, Muscat (OMA) Leigh McMillan, Sarah Ayton, Pete Greenhalgh, Ed Smyth, Nasser Al Mashari 220 points. 4th Gazprom Team Russia (RUS) Igor Lisovenko, Phil Robertson, Garth Ellingham, Alexander Bozhko, Aleksey Kulakov 213 points. 5th Oman Air (OMA) Stevie Morrison, Nic Asher, Ted Hackney, Ed Powys, Ali Al Balashi 198 points. 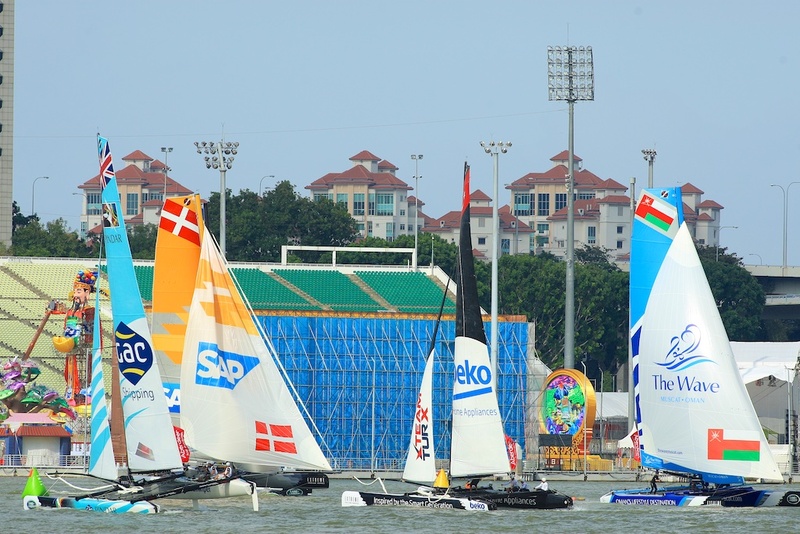 6th GAC Pindar (GBR) Seve Jarvin, Jack Macartney, Marcus Ashley-Jones, Tyson Lamond, James Wierzbowski 182 points. 7th Lino Sonego Team Italia (ITA) Lorenzo Bressani, Enrico Zennaro, Gabriele Olivo, Tom Buggy, Adam Kay 180 points. 8th Beko Team Turx (TUR) Edhem Dirvana, Mitch Booth, Selim Kakış, Diogo Cayolla, Anıl Berk Baki 166 points. 9th Team Aberdeen (SIN) Nick Moloney, Adam Beashel, Tom Dawson, Freddie White, Justin Wong 156 points. 1st Red Bull Sailing Team (AUT) 10 points. 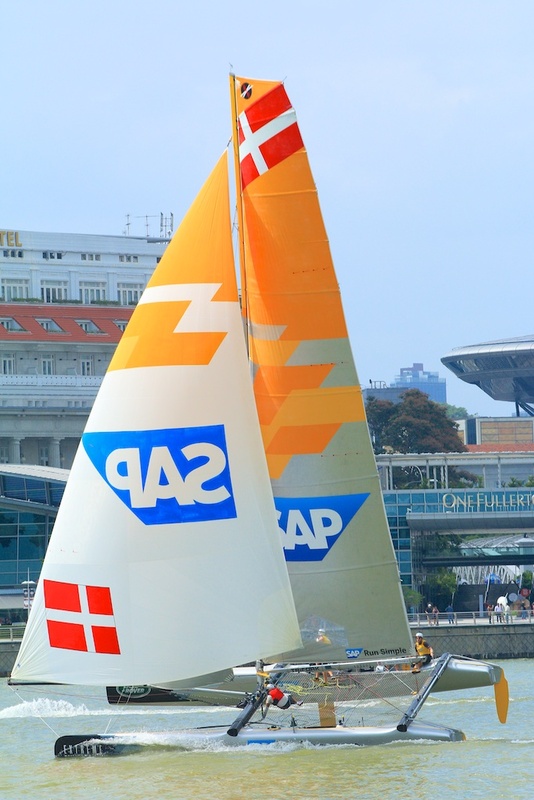 2nd SAP Extreme Sailing Team (DEN) 9 points. 3rd The Wave, Muscat (OMA) 8 points. 4th Gazprom Team Russia (RUS) 7 points. 5th Oman Air (OMA) 6 points. 6th GAC Pindar (GBR) 5 points. 7th Lino Songeo Team Italia (ITA) 4 points. 8th Beko Team Turx (TUR) 3 points.